We have the capability to accept and process both Government Purchase Cards (GCPC/GPC) from card holders and Purchase Orders (PO) from Contracting Organizations. All orders to Federal Government organizations and military units are TAX FREE. NO SALES TAX for official government/military orders. Select “Gvmt Purchase (GPC/GCPC)” as the Payment Method or ensure the “Govt Tax Exempt” box is checked (upon final checkout after entering your shipping/billing address). To order using your GPC, select the option to pay by “Credit Card” or “Gvmt Purchase (GPC/GCPC).” Ensure the “Govt Tax Exempt” box is checked (upon final checkout after entering your shipping/billing address). 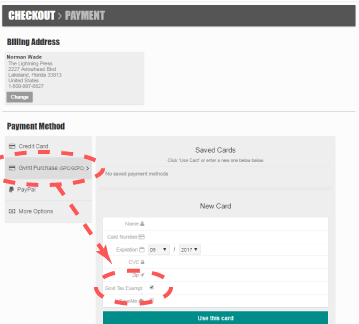 In addition to an on-screen invoice and (printable) receipt, you will be sent a receipt of your order via email.